The last Real Madrid game in 2012 didn't held a very pleasant surprise for the Spanish champions, as they visited Malaga and got beaten by 3-2. Things don't seem to be peaceful at the Bernabéu for a while now and José Mourinho's decision of benching Iker Casillas for this game, will certainly keep feeding the rumors and suggestions that the dressing room's atmosphere has met better days in the past. On his post-match press conference, the Real Madrid manager assured that Casillas has been benched merely due to a technical decision, as he believes Adán is currently on a better form. As for the game itself, Malaga got the better of a close match and are now only 2 points behind Real Madrid, in La Liga standings. The surprising news that have come out earlier this week, regarding Malaga's suspension from the European competitions next season, didn't seem to have played any negative effect in the home side, at least judging only by their performance this Saturday night. In the other hand, Real Madrid failed to impress once again, as they keep showing a lot of worrying defensive weaknesses. 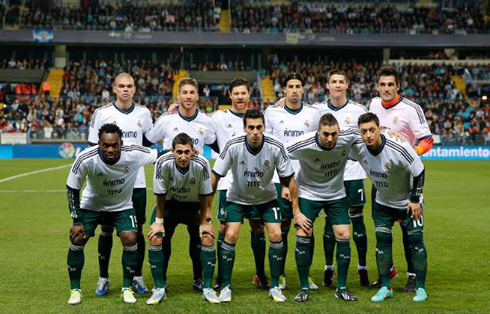 The first half ended goalless, but it wasn't like Real Madrid didn't create good opportunities to score. Cristiano Ronaldo had at least a couple shots that could have easily gone in, but for one reason or another, the chances ended up being wasted. The opener only came up in the beginning of the 2nd half and it was the home side who took the lead. Joaquín picked up the ball from a long cross and found Isco on the center more than ready to receive his pass. The Spanish rising star then succesfully striked the ball past Adán, who has been Real Madrid's goalkeeper this Saturday night, as a direct replacement for Iker Casillas. Manuel Pellegrini's men would regain the lead shortly after though, and what stands out the most from the play that led to the goal was the extremely poor positioning from Real Madrid's defence. A low cross from the right found Joaquín completely unmarked on the first post, who then backheeled the ball but saw it being blocked by Adán. The ball rebounded to Roque Santa Cruz, who has been left alone and completely unmarked on the 2nd post, and only had to push the ball to an empty net, putting his side on the lead for the second time on the night. Malaga surprisingly extended the lead just three minutes later, from a well performed counter-attack that started on Joaquín's feet. The Spanish winger had a brilliant display this Saturday evening and assisted Roque Santa Cruz for the Paraguayan second goal on the night, as he managed to beat Adán again, this time with a low left-foot strike. Mourinho couldn't be pleased with what he was seeing on the pitch, but no matter what changes he made into the team, they simply didn't seem to produce any of the desired effects. There would still be time for a small reaction from the Merengues, as Mesut Ozil picked up the ball from a wrong pass made by Malaga's midfielder Camacho, just before getting past one defender and assisting Karim Benzema for an easy tap-in at the second post. For a few instants it seemed that there was still hope for José Mourinho's men to turn around things in this game, but the truth is that nothing much would happen afterwards and the match ended with the 3-2 win for the home side. 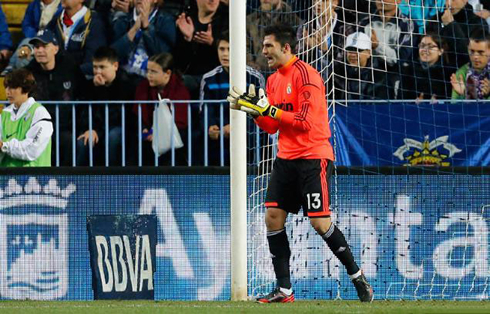 The Spanish League now returns on the 6th of January of 2013, with Real Madrid hosting Real Sociedad at the Santiago Bernabéu. Barcelona will go through this Christmas season knowing that they'll have a 16-points advantage over Real Madrid and 9 points over Atletico Madrid, who are still on second place. 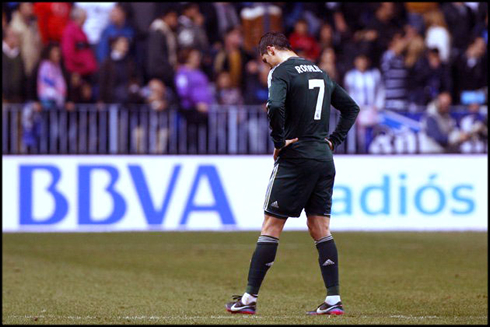 Cristiano Ronaldo next game for Real Madrid will be against Malaga, for the Spanish League 'La Liga', next Saturday (December 22, 2012). You can watch Juventus live stream, Real Madrid vs Real Sociedad, Barcelona vs Espanyol, Swansea vs Manchester United and Chelsea vs Aston Villa, all matches provided from our live streaming section.